Kel Crum writes: I think it speaks for itself. Agreed. 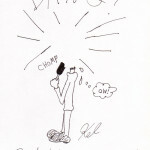 Cartoonist and comedy writer Kel Crum is the creator of Cornelia Cartoons. Order the collected paperback here or read some comics on his website, dangerousbird.com. Looks like Choco Home Run Balls are still around. I found this product review! Dining establishments named in the 1966 National Restaurant Association member directory. Sketches from 2002. Haitai Confectionery: Ad slogans and product descriptions awkwardly translated from Korean to English. Sketches from 2001-2002. Andy's Yearbook: Quotes taken from autographs in a 8th grader's middle school yearbook. Dissatisfied With the Vehicle: Quotes taken from transcripts of conversations between a market research firm and various dissatisfied car owners. Fridge Magnet Concoctions is the name of my long-running minicomics project. I make comics. I sell them at conventions. I give away some for free. 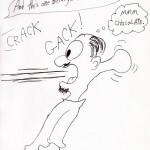 Sometimes I get drawings from cartoonist friends and acquaintances. This blog is one more way of sharing. Hard at work on Sucker Street. I haven’t abandoned it, honest! Thanks for your patience. ©2011-2014 Suzanne Baumann unless otherwise attributed. I do my best to contact all sketchbook artists before posting their work. If you see your sketch here and didn't hear from me first, please leave a comment and share a few words about it (or ask me to take it down, your choice).